It didn’t really need to be mentioned by head coach Andy Coen and the coaching staff, because everyone already knew. They all remembered last year’s beatdown by Bucknell at Lewisburg, 48-10. Many of them, even the sophomores, remember the pain of that day. 300 yards rushing by the Bison. QB Brandon Bialkowski‘s broken collarbone. Five turnovers. 130 yards receiving for Bison sophomore WR Will Carter. They also remember the humiliating exclamation point: sophomore RB C.J. 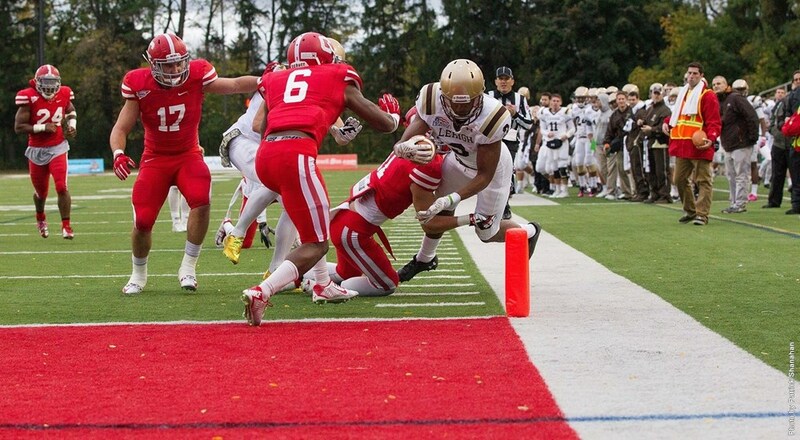 Williams‘ hurdle over Lehigh’s secondary, getting an emphatic touchdown to put the icing on the cake. Sometimes the pain of losses of games gone by can seem distant, unconnectable, by the playing members of a football team. There is no way for these players to imagine how it felt in 1997 for the Mountain Hawks to lose to the Bison, for example, the last time a Lehigh team had lost to Bucknell in football before last season. But last year’s loss was so raw, so emphatic, and so emotionally charged that nobody on this team could have possibly forgotten how it felt to go in there and lost that badly, that comprehensively. There was no need for coach Coen to invoke revenge in a fiery post-practice speech. They know. The season will start in 8 days! At no. 8, we look at junior DB/KR Jason Suggs as our highlighted Lehigh football athlete today.